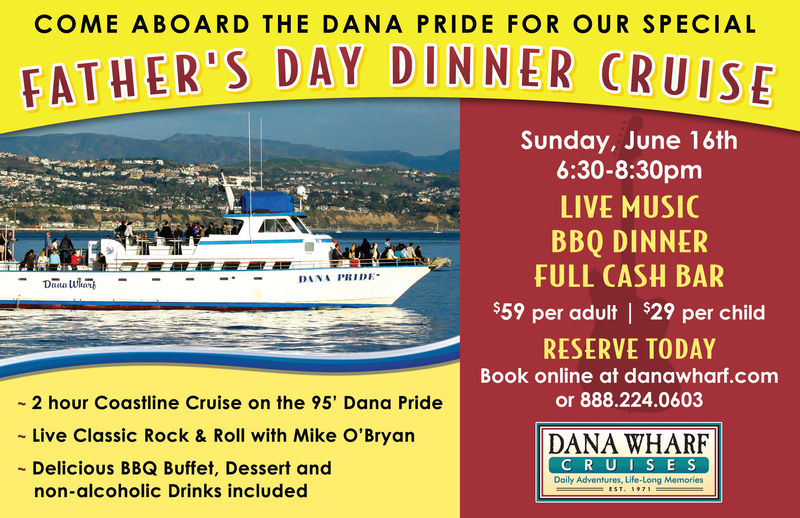 Come aboard the Dana Pride for our special Father's Day Dinner Cruise. Enjoy a unique evening of fun on the water, complete with live music and a delicious barbecue dinner! Listen to the live classic rock and roll of Mike Obryan, frequently found playing at Hennessy’s and other local venues in the Laguna Beach nightlife scene. Come aboard our 95 foot flagship, the Dana Pride, and have a one of a kind evening experience! And come hungry – this cruise is 2 hours long, and the perfect way for families to celebrate their dads with a delicious buffet barbecue meal!